This article was originally published on Houzz on July 6, 2016, as "Living Roofs Put Down Roots," and is presented here with permission. Read the original article. By now, we know that the first step to a sustainable home is insulation that maintains the interior at a comfortable temperature, no matter how hot or cold it gets outside. The next step on the journey is water management—collecting rainwater to supply toilets, washing machines or the garden. But equally important is minimizing water runoff (from concrete, roofing and paving) into increasingly overburdened stormwater systems. A green roof—with plants growing in an insulating substrate atop the roof of a building—helps solve both problems: insulating the house while absorbing water. It’s cooling, too, since it doesn’t have a surface that reflects the sun’s rays. Up until now, it’s been a fringe option, expensive and complicated. But with more and more suppliers bringing what they’ve learned in commercial applications into residential projects, it is becoming more accessible. Start with these inspiring projects from around the world. 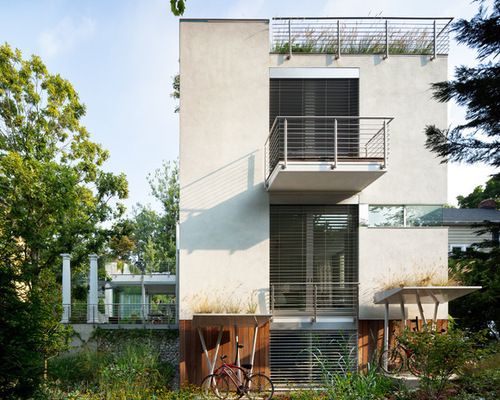 Living Roofs 1: Schulze Poursoltan Architects, original photo on Houzz. Living roofs on commercial buildings are often intensive and expensive. With full-size trees, room for paving and seating, and deep soil (sometimes up to 5 feet), these create a heavy load and require expensive engineering for support. 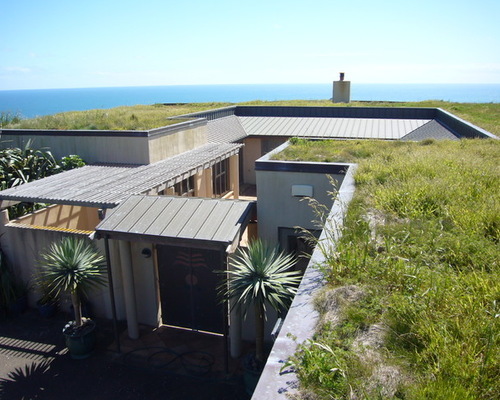 This beach house near Auckland, New Zealand, shows the most common planting: hardy grasses that can survive in a shallow substrate with very little maintenance or irrigation. Living Roofs 2: Contemporary Exterior, original photo on Houzz. Because green roofs can weigh more than 30 pounds per square foot for about 4 inches of substrate when planted and wet, the roof supports and walls must be designed by an engineer. You also need to think about drainage, as you don’t want soil runoff to clog drains and pipes and flood the roof. Designers recommend having a foot-wide band of stones or pavers around the edge of a green roof. Vents ensure that condensation does not build up in the ceilings below the roof. For this Australian project, the designers at Objects also had to ensure that the substrate would not slide down the sloping roof. They used a compact, well-rooted turf. Gardens may take time to establish, and bald patches may need replanting, as growth will be uneven on parts of the roof that don’t get sun or rain. In New Zealand, there are two main systems for roofs. One uses an applied substrate such as Nuralite, a waterproof membrane similar to that used on flat roofs under decking or tiles. It requires an appropriate foundation substrate (usually concrete or engineered plywood), and skilled workmanship by licensed installers, so there is no risk of the roof’s leaking and failing. Polythene, foam insulation and a drainage layer (a cupped product called Plazadeck to catch water, and a geo textile to prevent soil clogging) are applied before the special soil-growing medium and plants are installed. Alternatively, New Zealand company Stormwater360 has pioneered LiveRoof, a pre-vegetated, modular, hybrid green roof system. The plant modules are pre-grown so the green roof is already established, and there aren’t the usual maintenance costs to tend the baby plants and address soil issues until the roof matures. Mike Titchener of Stormwater360 says the right mix of low organic and high inorganic planting mediums, and at least three months of intensive care before the roof is installed, mean there will be no weeds and no dying plants in the hot, wet and dry microclimates on the roof. The company has numerous New Zealand native and sedum planting options. A showpiece for the technology is the Tuhoe Living Building project, for which the modular roof ensures that clean water enters the stormwater system (and there is up to 80 percent less runoff). 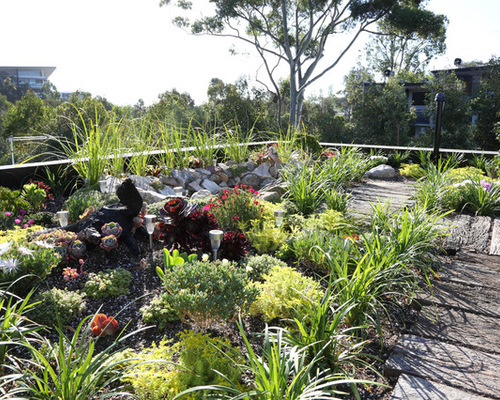 Living Roofs 3: Code Green Pty Ltd, original photo on Houzz. Green roofs are not just for rural settings. The roof of the international award-winning Forest Lodge Eco House by Code Green is in the heart of Sydney. The green roof was installed on top of structural steel crossbeams and a concrete roof, braced against the neighboring historic buildings. Plants were tested off-site to ensure they needed no human support to survive. There is also a 26-foot-high vertical garden. Both gardens are fed by underground water storage tanks. 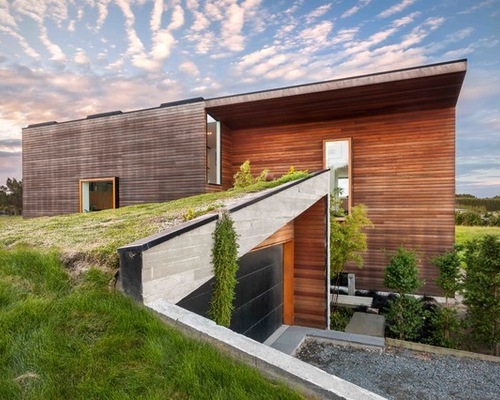 Living Roofs 4: Meditch Murphey Architects, original photo on Houzz. In a tight urban site in Maryland, the architects at Meditch Murphy Architects wanted to bring the outside indoors, and the owners wanted to be able to use the roof as living space, nestled into a canopy of mature trees. The architects engineered the roof to carry planters large enough to support 50-foot-high trees and soil deep enough to grow a vegetable garden. The roof also has solar panels and insulates the house. Living Roofs 5: Studio Schicketanz, original photo on Houzz. 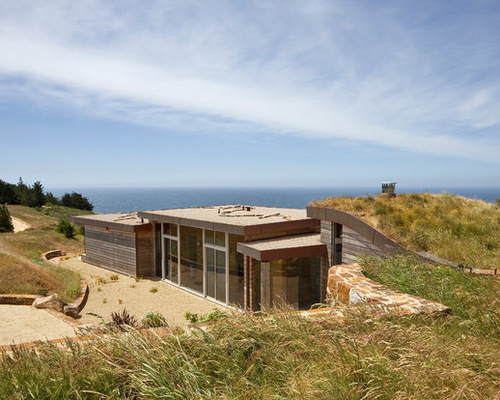 In coastal California, Studio Schicketanz used a green roof to conceal this home from neighbors above it. The building shelf was cut into the grassland, and the uphill land was extended as a green roof over the underground parts. The gently curved roof is the living room. The system is supported by a 15,000-gallon underground water tank. 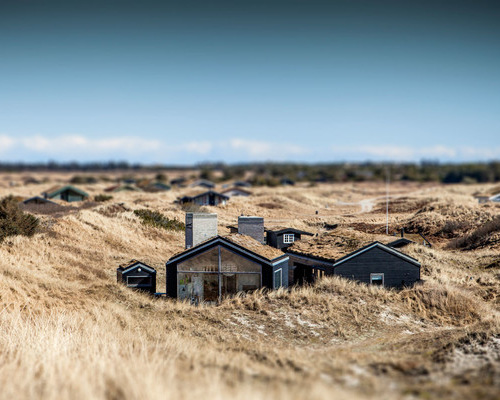 Living Roofs 6: Kassow Arkitekter, original photo on Houzz. And in Denmark, possibly the ultimate green roof can be seen on this summer cottage by Kassow Arkitekter. Roofs planted with the same tussock as the surrounding paddocks blend the house beautifully into its landscape.